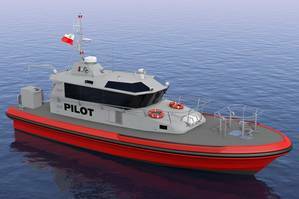 Shipbuilder Vigor said it has been awarded a contract from the Port of Los Angeles to build two 56' pilot boats. The new vessels, designed by Camarc, will feature a twin chine heavy weather hull form for excellent seakeeping. The design accommodates multiple heavy fender systems facilitating safer pilot transfers in challenging weather. An articulated rescue davit provides man overboard recovery. The overall design also maximizes the available horsepower and performance from a Tier III (non-catalyst) level engine. "Vigor is excited to be able to offer these pilot boats to the dedicated professionals of the LA Port Pilots," said Art Parker, Vigor sales manager. "Camarc has optimized this design to incorporate the significant seakeeping and safety of the larger pilot boats. The American mid-sized market has needed a world-class pilot boat at an acceptable acquisition and maintenance cost. This is without a doubt a proven break-through design."